A durable and well-built scanner. A well rounded scanning tool with an affordable price. An easy to use device for almost all users. This review of the Launch CRP129 scanner gives you all the information you need to make an informed choice in a car scanner. There is a lot of scanner information out there, but we have taken the key features and functions so that you get all of the relevant information without the disinformation. We cover the important points and get rid of the fluff. By the time you get to our summary, you will know if this product is right for you. This is a basic tool for basic users, but it does exactly what it sets out to do. 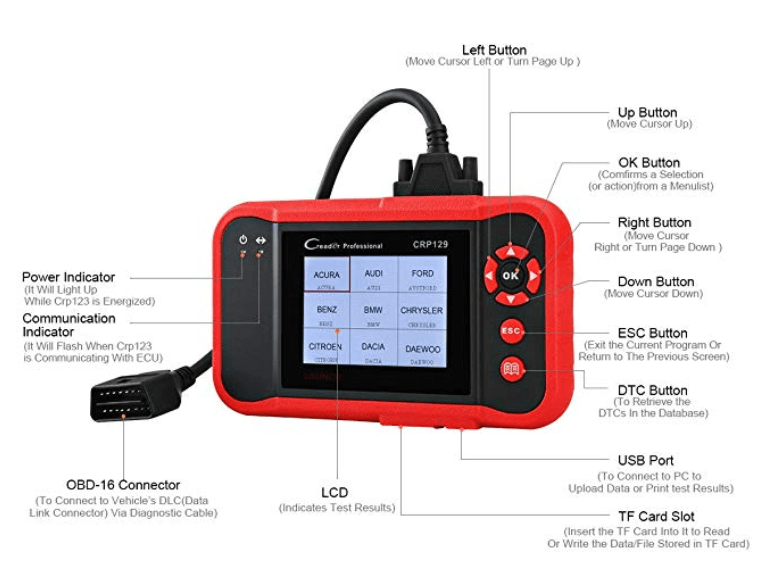 The interface is easy to use, allowing you to efficiently read and reset codes. The 3” screen is not as large as some others, but the information displayed is clear and concise, allowing you to easily decode the information on the screen. The control pad is also easy to use. You can scroll in any direction and easily select your topic. We like the dedicated ‘go back’ button to revert to the previous screen. This is a budget-friendly tool which can diagnose almost any vehicle produced after 1996. The only drawback to this tool is the lack of power and functionality. This scanner is aimed at basic users who want to read and clear codes and reset warning lights. The tool is also aimed at basic mechanics. The scanner will be able to read the most common codes in vehicles. Out of the box, you have the scanner itself, a detailed instruction manual which has everything you need to get your scanner up and running, a USB cable, and a connection cable. The software comes pre-loaded on this device, and you can update the device easily and quickly by connecting it to a computer. The main thing we love about this scanner is the ‘book button.’ When you read a code, you often need to refer to a book (or online) for more information. With the book button, you can receive more information on the code with the press of a single button. You save time looking up the information associated with the code and have it at your fingertips instantly. The scanner can read the check engine light and a lot more. You can reset the oil lights, EPB lights, and SAS lights. The device can also tell you why your transmission, ABS, and airbag lights are on. Other scanners only give you some of this functionality, but this scanner gives you it all. This scanner works on almost any car created after 1996, including domestic and foreign vehicles. The only thing you may need to check is the connection, but you can purchase an adaptor to convert the connection from 38-pin to 20-pin (and vice-versa). One additional feature which we like is the SD card slot. You can use an SD card with this device and save codes and information. This helps you to track your vehicle over time or save your diagnostics for later. You can then print this information for your own use or for someone else’s. This is a great scanner at an affordable price. It is a great tool for any amateur mechanic who wants to take care of their own vehicle. It is also powerful enough to be useful to professional mechanics too. 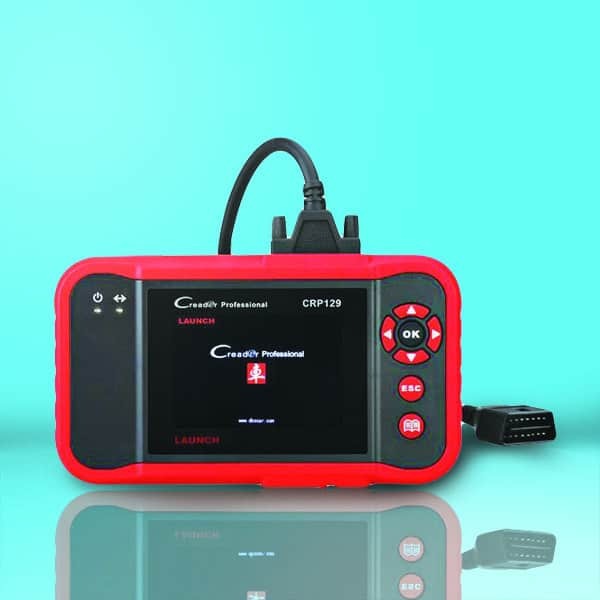 It is a quick tool which can diagnose your vehicles quickly, helping you to get them fixed and move onto the next problem. This device will save you a lot of money but is not as powerful as others on the market. If you are performing basic diagnostics, then this is a great choice.